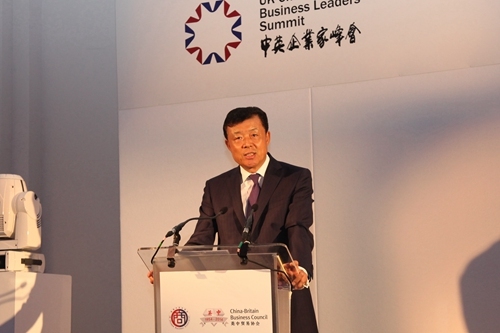 It is a pleasure to join you for this First China-UK Business Leaders' Summit. I want to warmly congratulate the Co-sponsors of the Summit, the UKTI, the CBI, and the All China Federation of Industry and Commerce. We all greatly appreciate the hard work of the organisers of the Summit the UKCBA and CBBC. ●Chairman Dong Wenbiao of Minsheng Bank, who is also Vice Chairman of the All China Federation of Industry and Commerce. ● Mr. Ron Dennis, British Business Ambassador and Chairman of the British East Asia Council. As spring is giving way to summer, temperature is not the only thing rising! Business interactions between China and the UK too are also soaring in speed. It shows the strong momentum of our business ties. ● UK-China trade surged 20.6% in the first four months. ●The UK now ranks as China's second largest trading partner in the EU. That is up from number three last year. ●And China remains the UK's second largest trading partner outside the EU. 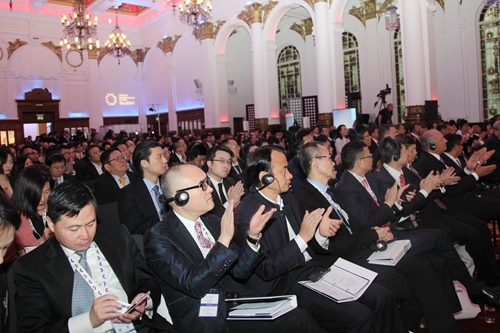 ●Over 500 Chinese companies are now established in the UK. ● 4.5 billion US dollars of Chinese investment has come to the UK in the first 4 months of 2014. ●Sector-wise, Chinese companies are expanding into advanced manufacturing, infrastructure, brand networking and R&D. This is in addition to established sectors of trade, financial services and telecommunications. That said, can we continue this progress, or even better in the future? I believe the answer is a very emphatic YES! The confidence comes from growing political mutual trust between our two countries. With joint efforts from both sides, high-level exchanges between China and the UK have gained momentum since late last year. 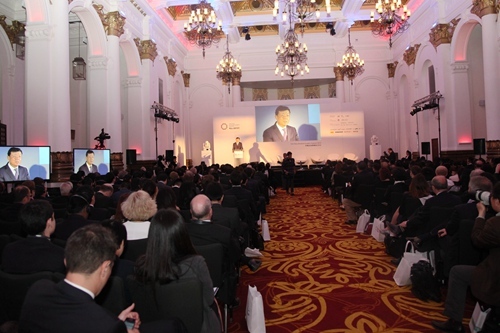 ● Last October and December, Chancellor Osborne and Prime Minister Cameron visited China. ● State Councillor Yang Jiechi came to the UK for the Strategic Dialogue last February. ● In March this year, Prime Minister Cameron met with President Xi Jinping in the Netherlands while attending the Nuclear Security Summit. ● Last month, the second meeting of our High-Level People-to-People Dialogue took place in China. ●And there are still more important visits in the pipeline. Close interactions at the top boosts mutual trust. In turn this drives our business ties forward by opening up new areas and enabling new models of co-operation. The prospect does look most encouraging on both sides. ● Rebalancing the structure of the economy. ●And upgrading the quality of growth. China used to be heavily dependent on investment and resources for its growth. Going forward, the Chinese economy will be increasingly driven by innovation. In this context, the Chinese economy is expected to grow at annual growth rate of about 7%. At the same time, the UK economy is very much on the rise. A 3% growth forecast makes this country a leader of economic growth amongst developed economies. China and the UK now have robust economies. The two nations are now bonding into a growth partnership. In turn, this will produce opportunities bigger than the simple sum total of the two. China and the UK complement each other well. ●The UK is a R&D and design centre for hi-tech, high-added value industries. ● China has developed unparalleled capacity for production and manufacturing. ●The UK R&D and innovation strengths combined with China's industrial prowess is a winning formula for both our nations. The UK needs manufacturing and good jobs. That need will be increasingly met by Chinese investment coming into Britain. Last, but not the least, there is a potential of boosting free trade between our nations. As you will know, last year Shanghai started piloting a free trade zone. Its experience and success stories will be gradually rolled out across China. Innovations in rules, technology and industries will create wave after wave of growth opportunities. ● China and the EU are negotiating an investment agreement. ●We are looking at prospects of a free trade agreement as well. ●The UK is a strong supporter in both cases. ●Free trade, be it within China or between China and the EU, will create a huge stage for business advance for both of our two countries. Physical distance is never a match for true compatibilities. We have the promise of the future. ●We have so many business leaders from both nations working hard for prosperity of our two countries. The best chapter of China-UK cooperation is still ahead of us. I wish this Summit a complete success!